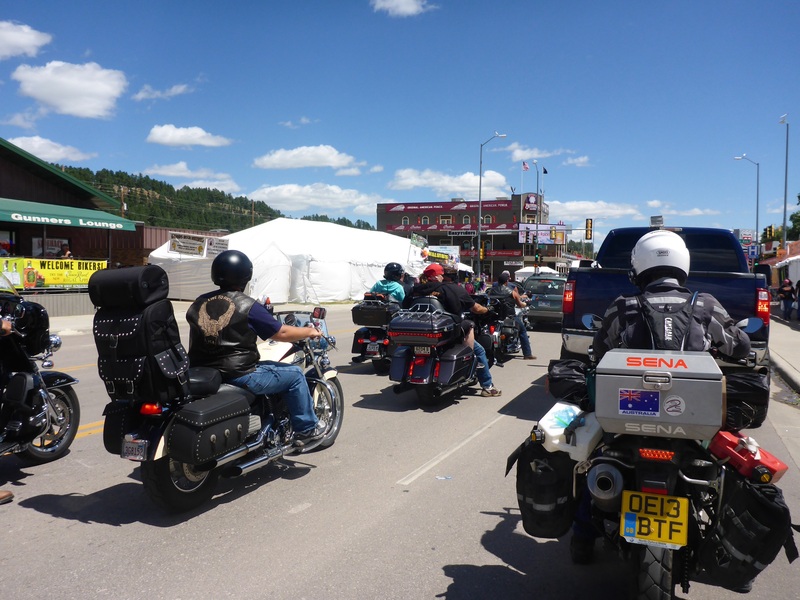 Sturgis, a name that many motorcyclists will recognise, the home of the largest motorcycle event in the world, the Sturgis Motorcycle Rally, held annually for the last 74 years, with 2015 seeing the 75th year of the event. The event, which is expected to draw up to a million visitors this year, is not our usual UNESCO site to visit, but being so close and probably not riding back for the 100th anniversary, we will take the chance to get bragging rights by attending, and securing event paraphernalia While the event does not start until next week, we wanted to get the lie of the land beforehand, hence a quick trip to our chosen camping/event site. Can someone confirm Sturgis is a UNESCO site? We travel from our Black Hills campsite, in which we sat through a one hour hail storm last night, towards Deadwood. 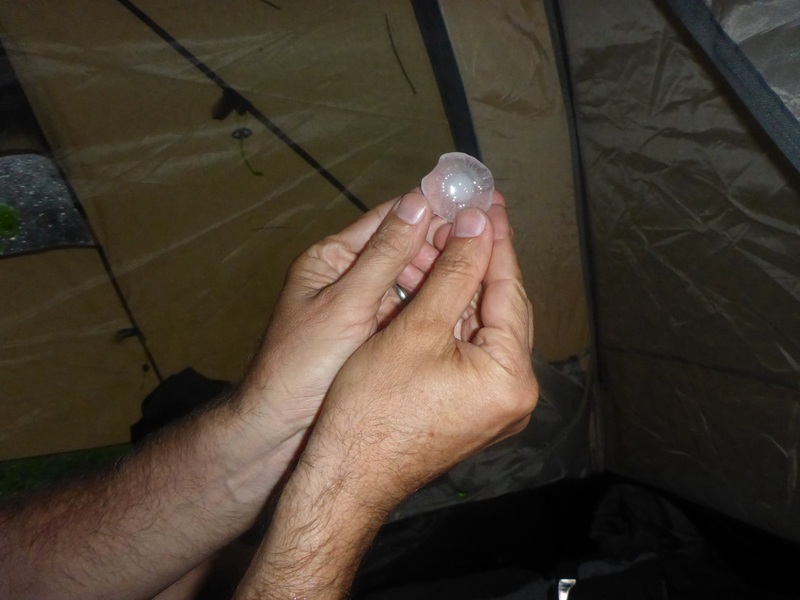 A little hailstone from around our tent. 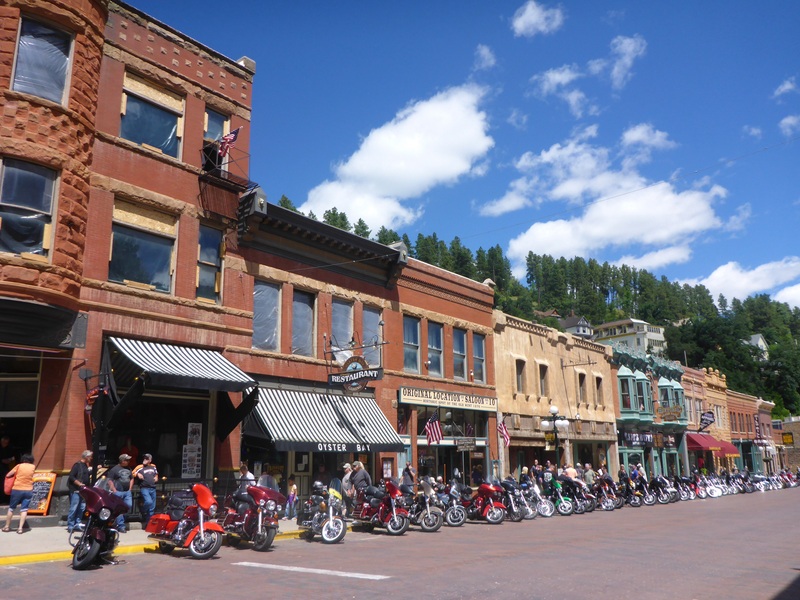 Deadwood is a famous town from the cowboy era, which today features a main street with one side dedicated to motorcycle parking only. Probably 150 years ago horses would have lined the street in the same place as motorcycles stand today. 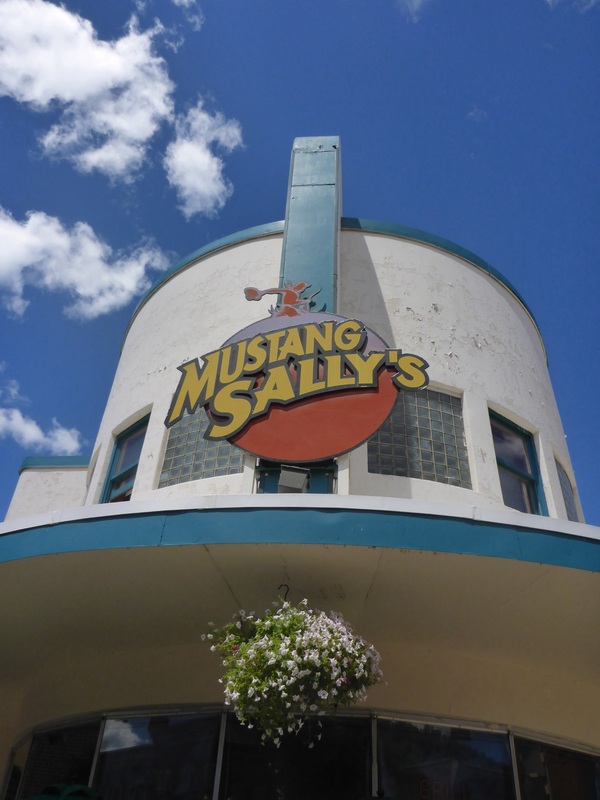 Historic buildings have been retained and now welcome tourists and gamblers. Yes, casinos have been established to take your money, replacing the card sharps and gunslingers of old. On from historic Deadwood to Sturgis. The town appears to be a hive of activity with setup work being undertaken. Merchandise tents and stands being erected, semi trailers full of with every conceivable motorcycle accessory plus all those mandatory Sturgis teeshirts being unloaded are the activities we see as we move from one tedious stop sign to the next. It is difficult to traverse the town’s main street under normal circumstances, what will it be like in a week’s time? Impossible I think! A small crowd of motorcyclists wandering the streets, looking to make purchases from the vendors. A good time to buy without the crowds, but there is nothing we really want. We finally get through town and head for our campsite which is where the major bands are also playing. 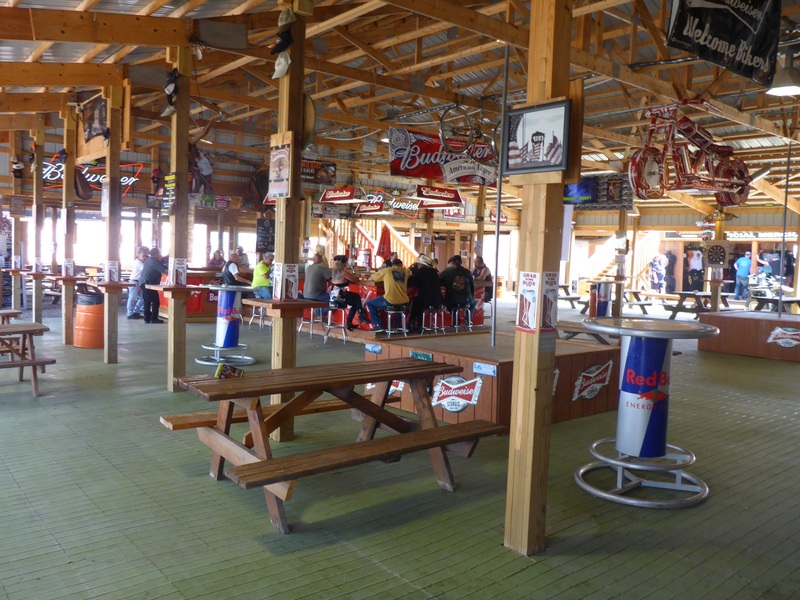 It is called Buffalo Chip and has become famous for great parties over the years. The place is almost empty, final preparations are underway. Looks like the calm before the storm. I am sure it will be so different next week. We get our wristbands for Monday and Tuesday night and learn that camping is first come first served and some people started camping a week ago to get good spots! Hundreds of thousands of people are not our thing and we are already starting to chicken out by thinking only one night at Buffalo Chip, due to the time it will take us to get to Yellowstone and back. This region is known for strong winds and we head west we battle strong gusty winds in the late afternoon. A reminder that we need to start riding early to avoid the physical strain that this type of riding brings. 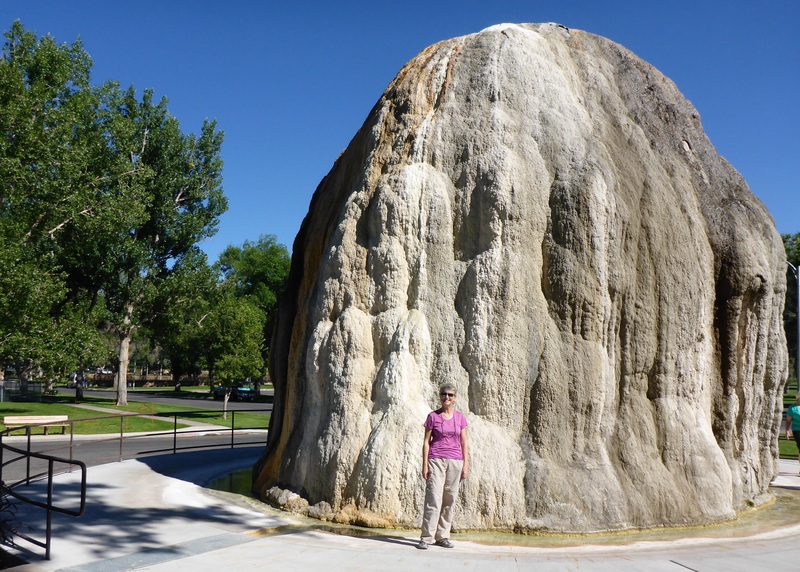 We are heading for Thermopolis, a small town in central Wyoming that is based around hot springs, hence the name from the Greek for ‘Hot City’. 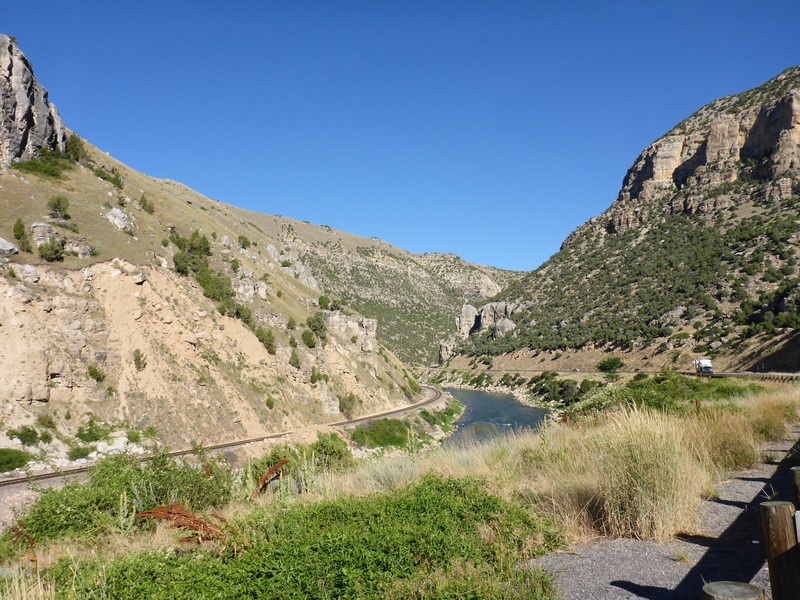 First we pass through the Wind River Canyon, this is a spectacular route, with the river sparkling in the sun as we ride. Wind river canyon, a great ride. 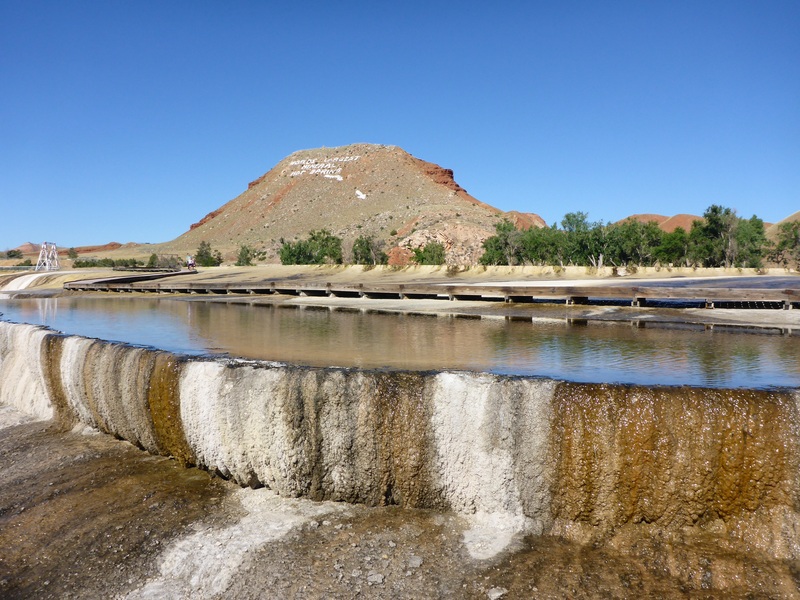 The hot springs at Thermopolis were part of an Indian reservation which was sold to the US Government with the proviso that the hot springs should be available to all people for free. This has resulted in a spa that is open to all for free, well, for 20 minutes at a time. We tried it and 20 minutes is more than enough! We enjoy a stroll through the park, seeing the hot springs running into the river – must be nice to have that warmth in winter. Wyoming is a big state and we enter our third day crossing it at our pace. We are heading for the Grand Tetons, somewhere we have not been since 1985, wow how time flies! First we have yet another pass to cross, the Togwotee Pass on US287 with an elevation of 9,658 ft (2,944 m) over. Over the top and we see the Grand Tetons for the first time in 30 years. We have a picture at home taken from our tent when last camped here and this view had recalls wonderful memories from the past. We pass Jackson, a well known ski town, as we head for Idaho Falls which is a far west as we will travel in the USA. Grand Tetons, our first view in 30 years. 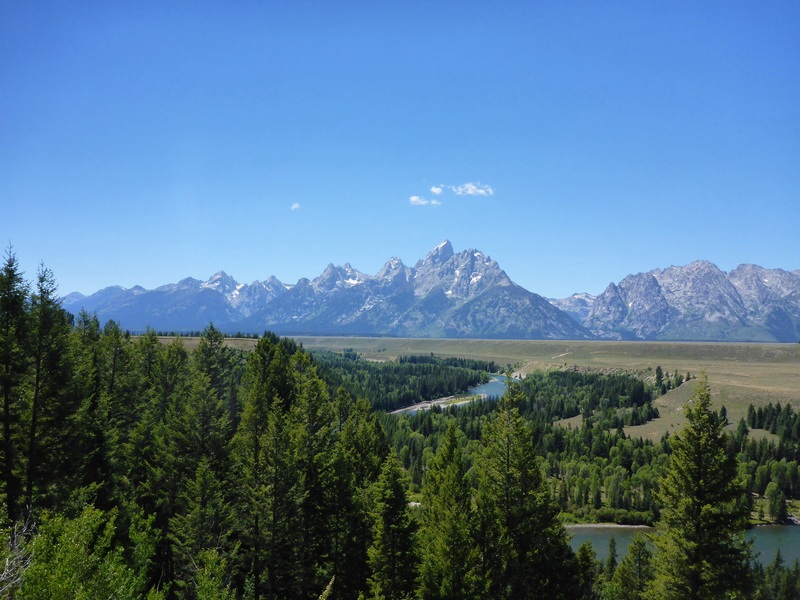 Great Teton photos. Enjoy the convention…! Onwards to the festivities. I look forward to the photos. I spent some time in Wyoming and like you think it is a great state. 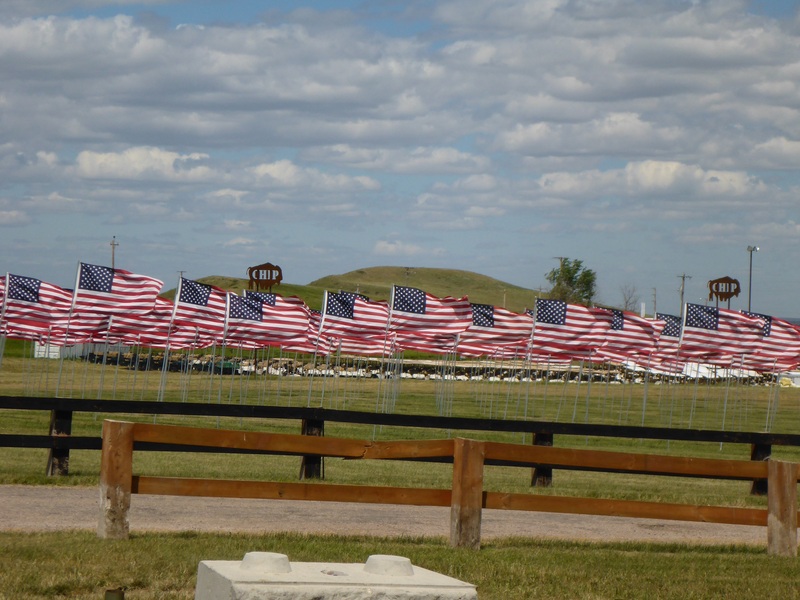 The rally at Sturgis is a world-wide renowned event, stay and soak up the atmosphere. You both seem much more relaxed and happy to deviate from the original timetable, I hope it continues. Anthony, try and stop Anne from getting up on stage and pole dancing, or entering a ‘wet tee-shirt’ competition. (Good luck with that). I looked up the definition of a UNESCO site and here it is: “A World Heritage Site is a place that is listed by the United Nations Educational, Scientific and Cultural Organization as being of special cultural or physical significance.” I think the operative word here is “special” cultural or physical significance. 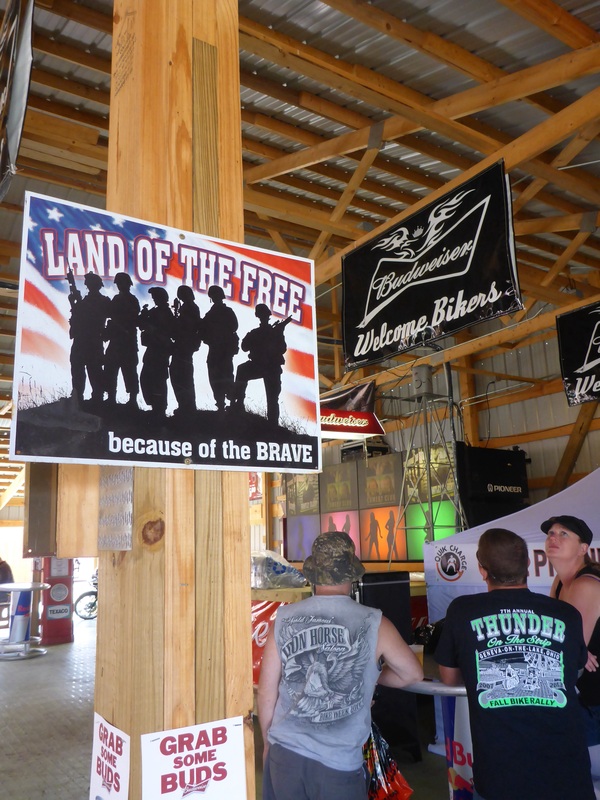 While a huge party is fun and can certainly change the physical aspects of a place, I would hardly classify Sturgis as “special” especially in light of the many other special and significant events here in the U.S. Just my two cents. You are right. It would be a stretch to get a UNESCO listing, but who knows in the future what will be considered a UNESCO heritage site in 50 years or so.